There had fallen upon the bar-parlour of the Anglers’ Rest one of those soothing silences which from time to time punctuate the nightly feasts of Reason and flows of Soul in that cosy resort. It was broken by a Whiskey and Splash. Unique in the canon of English literature, almost none of Wodehouse’s characters is indifferent to the temptations of a quiet snort. Wodehouse’s Drones will make for the bar like buffalo for a watering hole. Their lexicon for inebriated includes: awash; boiled; fried; lathered; illuminated; oiled; ossified; pie-eyed; polluted; primed; stinko; squiffy; tanked and woozled. And then there are the drinking exploits of old Pelicans Galahad Threepwood and Uncle Fred. In Heavy Weather, Wodehouse teases us with glamourous stories from Gally’s unpublished Reminiscences, including this tale of Plug Basham’s efforts to give up drinking. 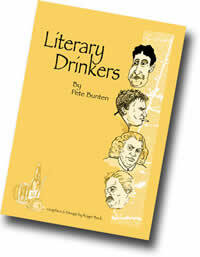 Wodehouse’s popular hero Bertie Wooster hero is, by his own admission, a comparatively light drinker. Except at times of special revelry, I am exceedingly moderate in my potations. A brace of cocktails, a glass of wine at dinner and possibly a liqueur with the coffee – that is Bertram Wooster. I could go on – and I had planned to – but in the course of my research today I’ve discovered a certain Pete Bunten has been there before me. Am I bitter? Not a bit. I can heartily recommend you to partake in a snifter of his excellent work, Literary Drinkers where he pays a fitting homage to our beloved Wodehouse. What are your favourite drinking quotes from Wodehouse?